With the airline industry moving progressively towards GPS and GPS Augmented based approaches and away from the more traditional ground based navigation aid approaches, the use of LNAV/VNAV – with all it’s eccentricities – are becoming the norm for many airlines, rather than the exception. The boon of flying such approaches more often is that your crews develop a body of expertise, particularly in regards to those eccentricities – but at the same time you expose crews to the vagaries of approach types that were previously not the norm, and to some degree were perhaps not designed from the ground up to be a mainstream solution for approach and landing. Note : Stating that “VNAV may not have been designed from the ground up to be a mainstream solution for instrument approach” may sound a little harsh – but can you really look at the full scope of VNAV and it’s implementation across the various phases of flight from Departure to Destination (and go-around) and not shake your head and asked if someone really designed it to be this way? Case in point is the requirement to intercept a VNAV Path based approach from above the programmed slope. 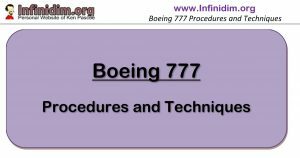 For pilots coming from a precision approach – intercepting an electronic glideslope from above is less than ideal, but a documented procedure in the Boeing FCTM using Vertical Speed (VS) is provided. The fundamental underlying assumption of this capture maneuver however is that the AFDS Glideslope (GS) mode is armed and will capture as the aircraft closes in on the electronic glideslope from above, hence providing protection against a below path situation developing during what can be a high workload phase of flight. There is no such armed mode in relation to VNAV – it’s either engaged (VNAV SPD/PTH) – or it’s not. 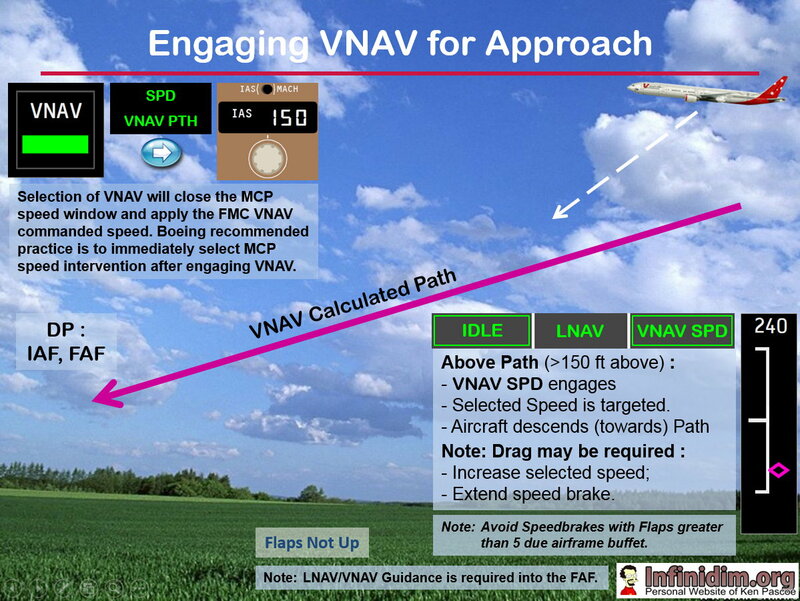 Hence using VS to capture VNAV PTH approach from above is not considered appropriate. Instead VNAV SPD is used. In this context – where VNAV is selected when more than 150 ft above the programmed approach path – VNAV SPD is an idle thrust descent mode, and the elevators will command speed without deviation (as far as possible). Once the thrust levers reach IDLE (or earlier, if the PF overrides the thrust setting) – the PF can vary the thrust to control the rate of descent. Unless the rate of descent is excessive in regards to your Airline’s maximum rate of descent in the terminal area, retaining idle is usually the norm. The more likely requirement is to increase the rate of descent to expedite descent on the Flight Management Computer (FMC) approach path – using judicious Speedbrake. Note that the MCP Altitude Selector is still a command instrument in this case – if you fail to capture the approach path before the relevant point on the approach – you’ll end up with VNAV ALT capture (ie: VNAV wants to go somewhere, and the MCP ALT-itude selector is in the way …). The MCP Altitude Selector also interferes with the progression of the approach down final, resulting in a capture anytime you forget to set a lower altitude, or the Missed Approach Altitude once that setting becomes appropriate. Refer back to the previous note on the designed-from-the-ground-up-NOT comment on VNAV. DP – thanks for the suggestion!